A virtual visit to the mysterious and inscrutable orient is never far away for fans of online slot machines and Caishen’s Gold offers us one more chance to make that trip; it’s a game developed by Pragmatic Play with some colourful graphics and some tasty jackpot prizes. Caishen’s Gold is themed on the title character who’s the Chinese God of Wealth – always handy to have on your side when you need a bit of luck spinning the reels. It’s a five reel slot with three rows and two hundred and forty three ways to win and behind those gold-framed reels we can just about make out a sunny landscape where payline standards swing in the breeze. The higher value symbols include a baby boy, a baby girl, a lotus flower, a traditional fan and a stringed instrument; 9, 10, J, Q, K and A make up the lower values. Caishen himself is wild, he appears on reels two, three, four and five and he’ll substitute for all others to help form winning combinations except for the golden gong scatter symbol. Every time the wild appears in the base game there’s a chance that the Jackpot game will be triggered; a second screen will appear with twelve coins displayed and all you have to do is select them until three matching symbols are found – this will determine which of the four jackpots (Mini, Minor, Major and Grand) will be won. These are fixed prizes and respectively they are worth 30x, 50x, 100x and 1000x your total bet. 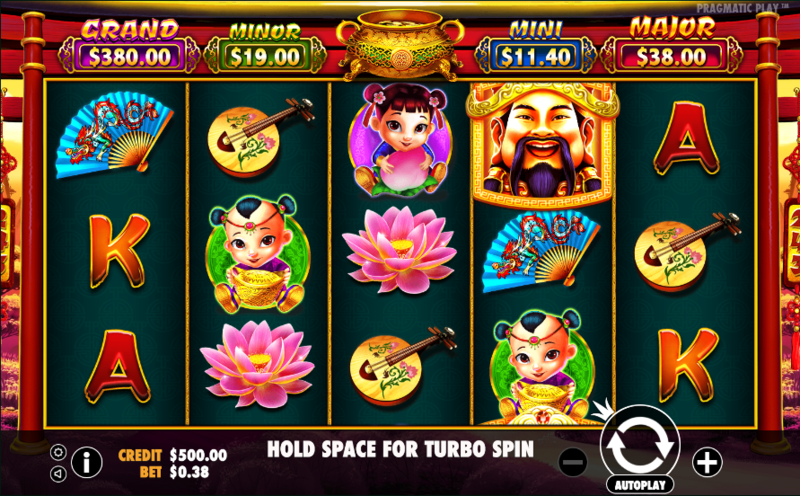 This is triggered by landing three or more of the golden gong scatter symbols from left to right on adjacent reels for which you will receive an initial ten free spins but these can be retriggered an unlimited number of times. During the spins only the higher value symbols, wilds and scatters are present on the reels. 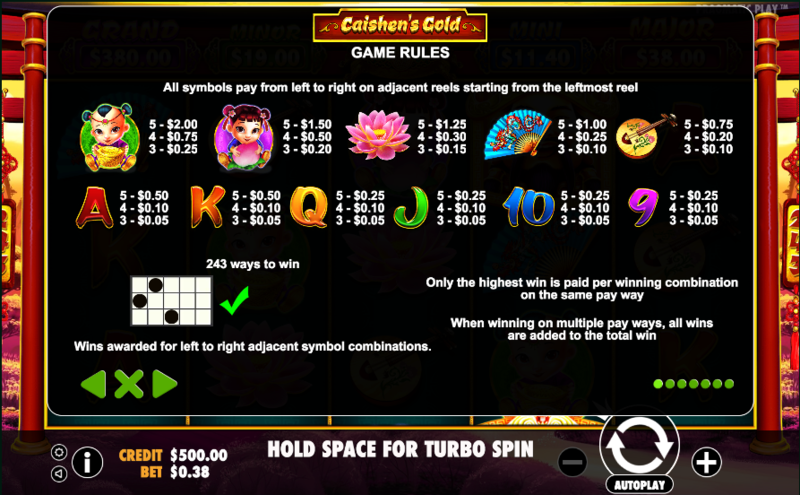 Caishen’s Gold follows the format of other Pragmatic Play slots but there are some nice bonus features here and their high quality, idiosyncratic graphical style. This game comes with a nice high RTP of 97.08%.